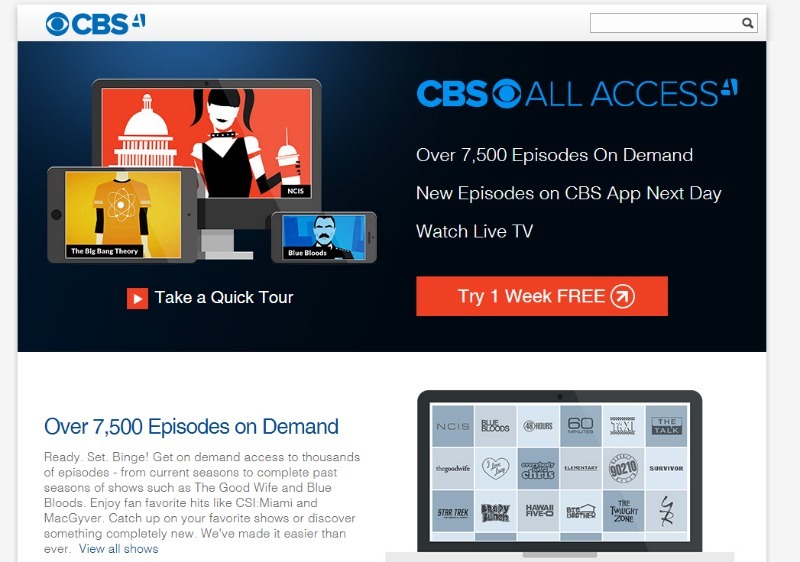 I signed up for the CBS All Access video service when they were running a promotion for a month-long free trial (no longer available). The service runs $5.99 a month. I tested the service on my Roku box, my Samsung Galaxy Note 8 tablet (Android) and my iPad Mini first generation (IOS). Sign up was super easy. I just had to create an account, enter billing and credit card info and I was good to go. I didn’t need to wait for a confirmation email to use the service. CBS has a lot of long-running shows and most of that content is available on the service. NCIS and its spin-offs. Criminal Minds. MacGyver. CSI and spin-offs. All 175 episodes of Family Ties. All 264 episodes of Frazier. All of the Star Trek series are available on demand. The content also includes current shows and the option to watch live TV. The few shows that were missing seemed to be tied in to current licensing deals. When I started my free trial, there were only clips from the series EXTANT – no full episodes -Amazon had exclusive streaming rights to the show. When season two of the show started, the season one episodes finally appeared on ALL Access. There are no season two episodes because Amazon still has exclusive rights to those. CBS’ Elementary is another strange situation. Right now, seasons one through three are streaming exclusively on Hulu Plus. CBS All Access is only showing episodes from season three on demand. Hulu Plus’ original announcement seemed to indicate that its agreement for Elementary only covered past episodes, not the current ones. Most new episodes appear the day after the show airs on television. The Kindle version of the app lists an 8 day delay for episodes in HD. I tried the CBS app on three different devices. The experience was slightly different on each one of them, but the two things in common across all three platforms were the excessive adds and the video glitches and quality problems. The advertisements on this service are, quite simply, awful. There are tons of ads and they played before, during and after the show episodes. The sound volume of the ads was extremely loud compared to the video volume. The ad choices seemed especially irritating. The fact that they were played repeatedly through out an episode only increased my annoyance. The series of Jack Link’s Jerky commercials featuring the abuse and bullying of Sasquatch stood out as being particularly noxious. On the Roku, ads played an average of every eight minutes. The cutting process was really awkward. After the commercials, the show would replay the last few seconds before the break and playback would repeatedly stall and need to reload. I have DSL, and the app did not handle a slow connection well; at times the quality was very poor and the audio would be slightly out of sync. This was especially noticeable compared to Netflix, Amazon and Hulu which seem to do a better job of balancing slower connections. Viewing on the Android app showed most of the same problems with ads and audio sync issues as the Roku. For the most part, the video quality was somewhat better on the Android than the Roku box. The picture quality on the iPad Mini was the best out of the three devices, although the audio sync problems were still there.The IOS app had full page ads built into the app that were really disruptive. Both the Android and IOS app still showed a large number of commercials, but they seemed to be less frequent at the beginning and more frequent towards the end of the episode. All three platforms had closed captions, although the settings were a little more difficult to figure out on the Roku app as they worked a little differently than I was used to on Netflix, Amazon and Hulu. On the IOS app, I could turn on captions from within the app for streaming, but the app defaulted to the main IOS setting when watching live TV. I live right outside of Chicago and had no problems with the app recognizing and streaming my local CBS station live. The commercial ads shown during the live didn’t seem the same ones I saw on the on demand side of the app. There were a lot of very short commercials but I didn’t see anything I recognized as strictly local to Chicago. With a price tag of $5.99 a month, the advertisements and the poor video quality on the Roku box were deal breakers for me, especially after trying Hulu ad-free. I canceled the service near the end of the trial. Canceling the service was very easy. I simply clicked a link on my account page to cancel, although a toll-free number is also listed on the cancellation page. I was asked to give a reason for canceling (it was optional) and given an opportunity to provide feedback (also optional). I received an immediate email verifying my billing cancellation. I was also informed that I still had access to the content until my trial period actually ended. Unlike previous series, only the first episode will air on television. The new series will be the first exclusive series for CBS’s “All Access” online streaming service, which currently costs $5.99 per month. I am a die-hard Trekkie, but unless this service gets significantly better, I will be waiting on the new series until it is out on DVD. I don’t get making the show exclusive to All Access unless they are just trying to boost the adoption of the app. So, how about you? Have you tried the service? How do you feel about CBS making it exclusive? It is good that CBS is looking at a version without ads, but $9.99 for one network’s offerings seems a bit steep compared to Netflix, Amazon and Hulu Plus. This entry was posted in Our Digital Life, Video and tagged CBS All Access, Star Trek, streaming. Bookmark the permalink. Good review! We haven’t tried and have no plans to, even being Trekkies. We’ve already got Hulu and Netflix, so we’ll manage somehow. At least we have the other Trek series seasons on DVD (or VHS, ha ha). Thanks! Like you, I have all the Star Trek series on DVD. They are also streaming on Amazon Prime Video, Netflix and Hulu, all without commercials. CBS really needs to up their game and offer users a better experience! Sounds like CBS needs a free all-access with the delays and ads, and a premium at maybe $7 with HD on minimal delay. Personally, I’d consider a $3 SD stream with a day delay. I don’t own any non-mobile HD devices. I love that you brought up an SD option. I frequently buy videos on Amazon in SD. The picture quality is decent, it plays better on slower speed internet and doesn’t eat up all my bandwidth. Great idea! I updated the article to reflect CBS CEO Les Moonves’ comments hinting about the possibility of an ad-free version for a higher price. I tried the CBS All Access free trial on my brand new Apple TV 4th gen. I noticed that there are streaming issues where the quality will go bad for a while and then correct. Probably the most annoying thing though, is that the audio is out of sync when watching live TV. The dialogue coming out of an actor’s mouth is not in sync with their lips. I have a 100 Mbps broadband connection, so I know it’s not my network. Needless to say I am cancelling before the free trial is up. Glen,thank you for confirming that it wasn’t just my slow DSL line. Art your connection speed, there is no reason for poor streaming quality or out of sync audio! Glad I canceled.